Home / Politics / RUTO will never win the presidency in 2022 – He will watch RAILA ODINGA being sworn as fifth president of Kenya! 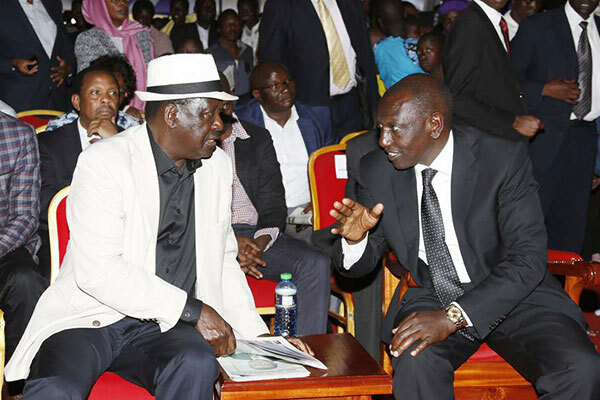 RUTO will never win the presidency in 2022 – He will watch RAILA ODINGA being sworn as fifth president of Kenya! Thursday November 1, 2018- Kajiado Central MP, Elijah Memusi, has said Deputy President William Ruto will not win the 2022 presidential election. Already, Ruto has hit the ground running in popularising his presidential of succeeding President Uhuru Kenyatta in 2022. But according to Memusi Ruto can never win the presidency because no vice president has ever won the presidency in Kenya except former President Daniel Moi who became president after the death of Mzee Jomo Kenyatta in 1978. “We do not have a history of Deputy Presidents succeeding their bosses, the case is only unique to retired President Moi whose ascent can only be attributed to the death of President Kenyatta)," Memusi said. The ODM elected MP further called for political calm, terming it immature for politicians to engage in succession politics at the moment. He urged Ruto to calm his camp which is growing excited over his candidature, advising him to instead concentrate on aiding President Uhuru Kenyatta in delivering on their campaign promises.